Next up is meterec, which brands itself as a multitrack audio recorder based on the JACK sound structure. 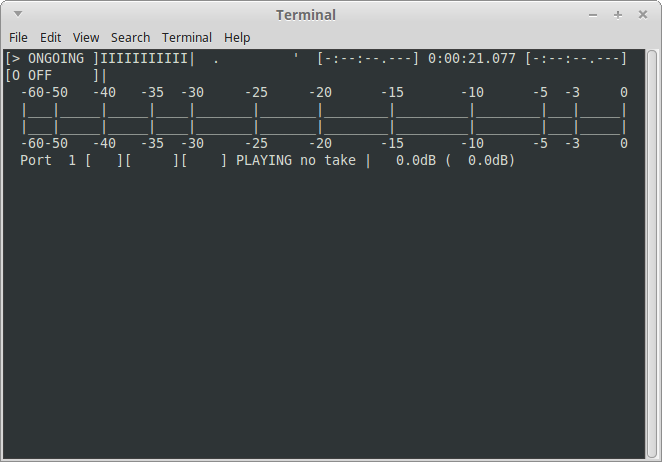 I must also hold out a rather weak thumbs-up for this one, mostly because I had serious difficulty getting this to work against JACK in both Debian and Arch, but also because audio recording at this level is far beyond my skill set. I have a very basic understanding of the needs and use of recording enthusiasts, but aside from pressing “play” on a CD player, I don’t have much musical ability. Which means that the world of audio recording is mostly foreign. I have a stronger understanding of playback (I was once a rabid audiophile) but nothing to clue me in on how to use meterec. In fact, what you see in the image there is just the Debian version running its interface demo, and I don’t think anything was actually accomplished there. The Arch version was likewise puzzling to me, and again I have bumped up against my time limit for exploring software intricacies. I like that there is an interface, and from what I can tell by pressing random buttons, it seems well behaved. There are mute, pass-through and looping features all listed in the --help summary, so you shouldn’t need too much prodding if you know what you’re doing with a multitrack session recorder. I, on the other hand, am just a babe in the woods when it comes to this type of software. And add to that my unfamiliarity with JACK, and my lack of any real musical talent, means it may be a very long time before the intricacies of meterec are clear to me. This entry was posted in Linux and tagged audio, loop, music, recorder, session on 2015/01/17 by K.Mandla. I mentioned a lot of terminal recorder options in the past, some good and some bad. ttyrec was one of those, and while it alone didn’t really impress, it is getting a small boost from ipbt. You’ll have to look close at that image to see ipbt’s contribution. 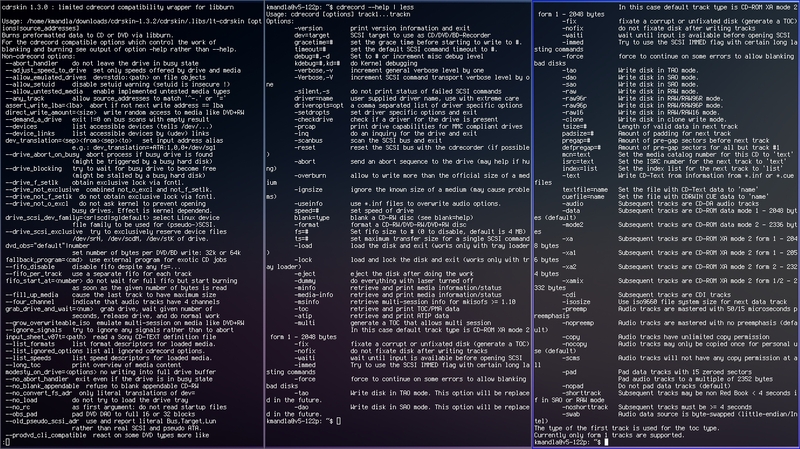 What otherwise just looks like a screenshot of a slightly mangled htop session is ipbt’s frame by frame controls and on-screen display. ipbt adds just about everything you could want to ttyrec playback. Pause and start keys, frame advance, time compression, jump-to-frame and jump-to-end keys, and a bunch more. ipbt will even allow you to search through the text in the frame. It’s not exactly an Esper machine, but it’s clever. Unfortunately, ipbt can’t do much about ttyrec’s overall quality, and the frame above is a good example. ipbt allows you to step through those recordings and perform a heady acrobatics with them, but I’ve seen very little from ttyrec that wasn’t mangled to start with. So perhaps ipbt is just lipstick on a pig. This entry was posted in Linux and tagged control, playback, recorder, recording, terminal on 2014/09/01 by K.Mandla. I wasn’t going to include script in these little adventures, but owe a day’s worth of programs after skipping a day yesterday, and script isn’t terribly difficult to cover. Try this at home then, and see if you are as astounded as I was when I first saw it happen. And the output is “Script done, file is man.session”. And you get a perfectly timed session replayed as you like. And yes, it works with ncurses and fullscreen apps, and as far as I can tell, there doesn’t seem to be a limit on terminal dimensions (except perhaps on replay … I don’t expect it can cram a huge recording into a tiny window frame). I’m sure they all are fine and dandy. 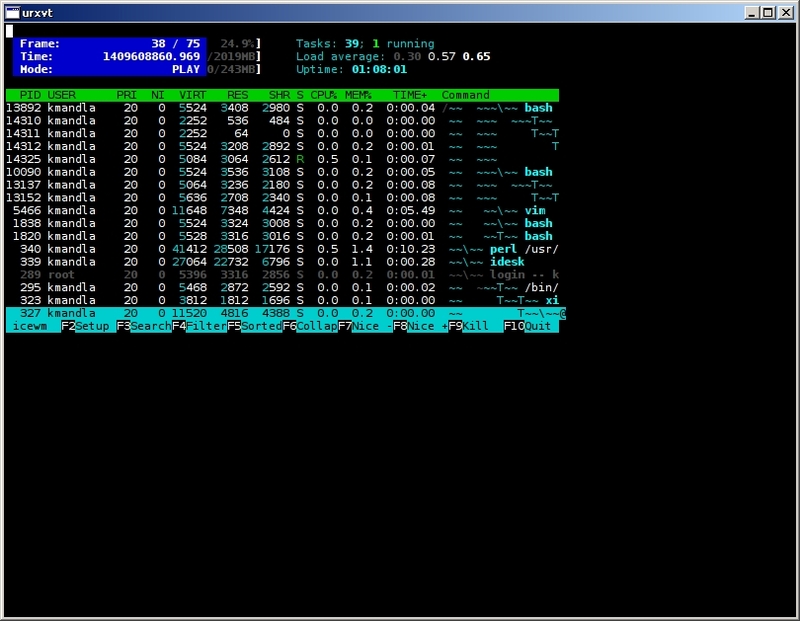 And yet, from the depths of util-linux comes a simple, straightforward terminal recorder that’s been around … well, since forever. This entry was posted in Linux and tagged console, output, recorder, session, terminal on 2014/05/07 by K.Mandla. In the beginning, there was cdrtools. Most everybody used it, and nobody had any complaints. Then in 2006, the programmer changed the license from the GPL to the CDDL, although I don’t know why. All is well except for Debian, whose grand poo-bahs say, “Hey, that there ain’t in line with our philosophies.” Although I don’t know why. So in what could only be called a coup d’état, the Debian masterminds scalp the last GPL-licensed release of cdrtools, dub it cdrkit, and promise to keep stride with whatever happens in the original. Although I get the general idea why. So now there were two symmetric projects, and sometimes one is available in your distribution. Sometimes the other. Sometimes … both! Although I don’t know why. Here’s where things get even more blurry for me. Along comes cdrskin, which is part of a separate project, but is designed as a drop-in replacement for cdrtools’ original cdrecord program. So there’s a CD burner project, plus another that mimics it but is licensed differently, and yet a third that pretends to be the original, but actually comes from a completely different direction. And I don’t know why. Now there is a strong possibility that some or all of this little drama has been misunderstood on my part. If so, my sincerest apologies. But in short, if I’m right, all three should look roughly the same. This entry was posted in Linux and tagged audio, burner, cd, dvd, music, recorder on 2013/09/24 by K.Mandla.